One of the first tasks I set myself as Collections and Exhibitions Manager was to start dating some of the collection. After all, if I’m going to interpret it, I have to ‘get to know it’. I’m fortunate enough to have a small selection of trade catalogues to help me do this; the only tricky part is the fact that none of the catalogues include publication dates. Nevertheless, it’s still possible to get a ‘feel’ for the period they date from based on the designs, as well as the listed prices of course. Luckily though, my task has been made a lot easier based on tips from two volunteers I’m fortunate enough to have working with me on this project. Hilda Maclean, graduate student from the University of Queensland has already produced some fascinating research on Victorian coffin furniture excavated in Brisbane (most of which was actually manufactured in Birmingham!) and thanks to her involvement she pointed me in the direction of some very useful information held at The National Archives. Another volunteer, Sarah Hoile who is currently researching 18th and 19th-century coffin fittings also suggested that I consult the wealth of records held at The National Archives. Hilda gave me a fantastic tip of using the registered design numbers on the coffin furniture to date objects. 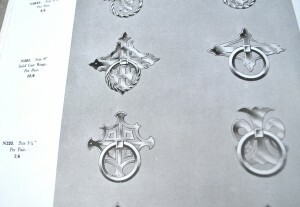 Some companies, like Newman Brothers registered their new designs with the Board of Trade in order to obtain copyright protection and these designs were given unique numbers. 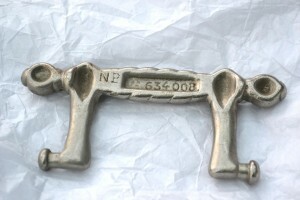 I’ve managed to find a few of those unique numbers on a select number of coffin handles, the oldest design of which so far dates from 1914. 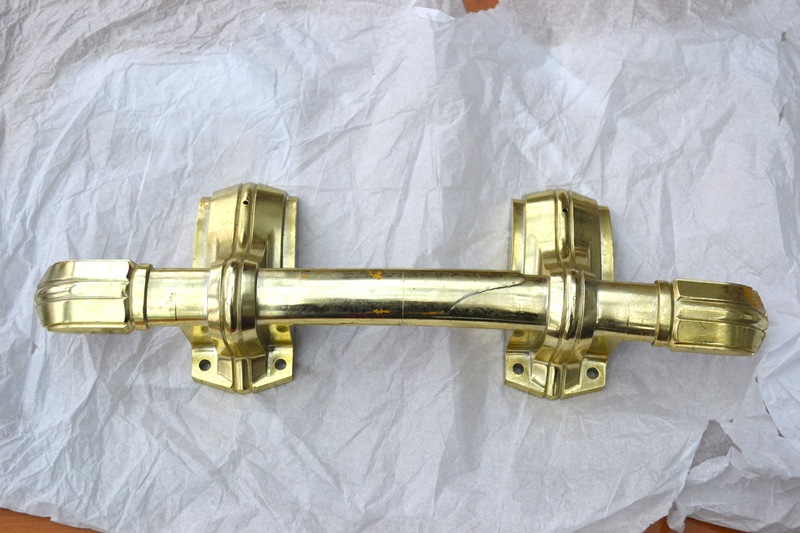 That’s not to say that the actual coffin handle dates from then as designs were kept in production over a significant period of time if they proved popular. But, what this is allowing me to do is place the Newman Brothers’ catalogues, and therefore products, within fixed date ranges. 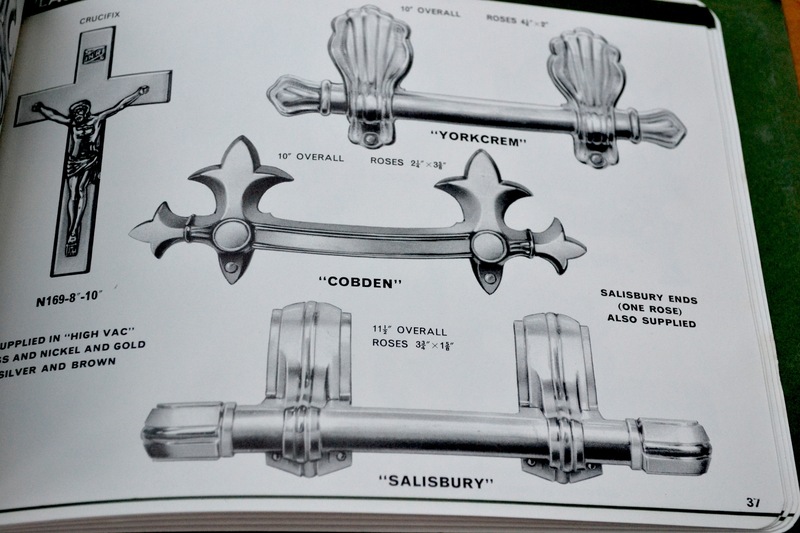 For example, I discovered today that the coffin handle below was first registered with the Board of Trade in July 1964, and this design also features in one of our trade catalogues, allowing us to confidently say that the catalogue in question was produced no earlier than 1964. This ties in perfectly with information from an ex-funeral director who worked in the trade in the 1960s as he also dated the trade catalogue to around the late 60s. 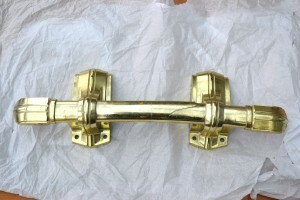 I also found this beautiful brass-ring handle in the collection, which similarly has a registered-design number. 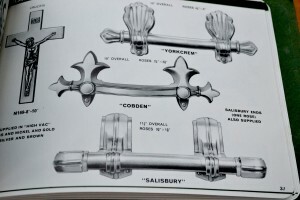 After dating the design to 1924, I decided to look in one of the trade catalogues I suspected also hailed from the 1920s to see if I could find the ring handle pictured. Lo and behold, the exact design is listed along with its corresponding Newman Brothers’ catalogue number: 233. It would seem that the catalogue can be no older than 1924 and I suspect not much older than the late 1920s. 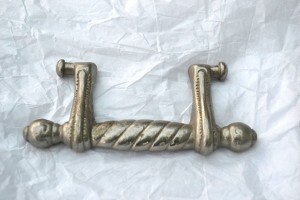 With help from The National Archives, I’ve also managed to locate a record of a Victorian design dating from 1894. 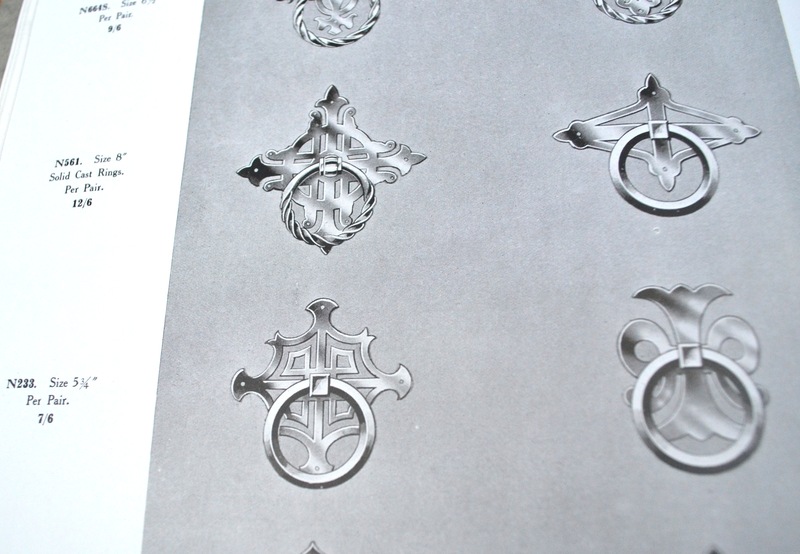 For me, this is a significant record as it would have been one of the first designs that Newman Brothers registered in their first year of business. 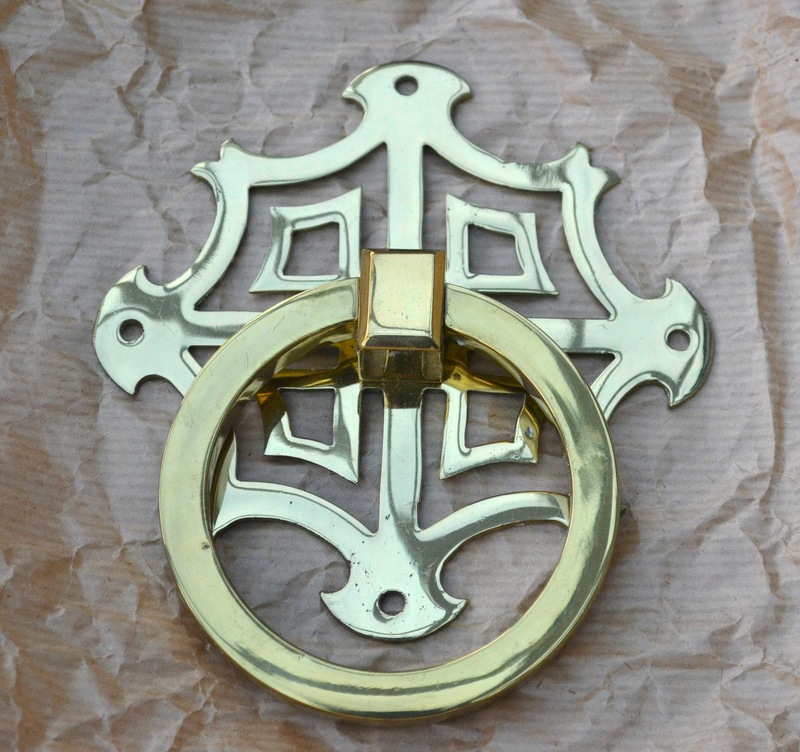 I’ve requested a digital copy and fingers crossed it will include an original design of the coffin fitting. 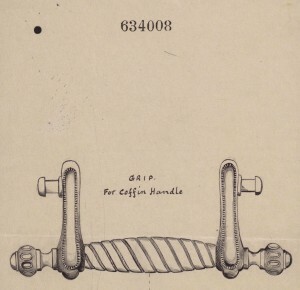 It may transpire that we don’t have any surviving Victorian coffin furniture in the collection, and if that is the case, the opportunity of seeing a copy of an original patent design dating from 1894 will be very special indeed. Watch this space!